File contains newspaper clippings regarding Colonel Harold Carswell becoming Commander of CFB Trenton in 1968. Postcards of the Administration Building at R.C.A.F. 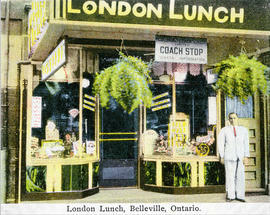 Trenton and of the London Lunch restaurant at 174 Front Street, Belleville, Ontario.